Emma made playdough (her own recipe of oil, lemon juice, flour, water and salt cooked until firm) getting it to a good consistency so that she and Macsen could build little ornaments and figures. She loves making goopy things. We were also able to have another full school day with somewhat fewer complaints than when we are on land. The monkies are generally relatively good about school but they do whine a bit to get it over with when there is swimming, playing with friends and running about to be done. Seems rather a desperate measure to take your kids to sea to minimize distractions…but it does seem to work. We went through a small squall early this morning with winds rising to 28 knots and a little rain but reduced sail and were soon through it. The waves have become larger and the wind has picked up slightly but we are still sailing comfortably. The period of the swell is so long that you hardly feel the boat being lifted and dropped although we are traveling up and down >3 meters every few seconds. To date we have been heading in a more southerly direction to pick up the trade winds and give ourself a better angle on the wind. 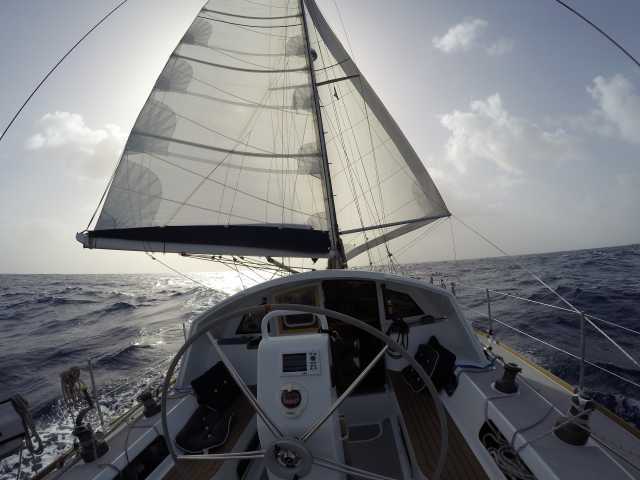 We have just gybed onto our rhumbline for Paramaribo and are wing and wing going a steady 7-7.5 knots. Wooohooo!